Willie Nelson and Kris Kristofferson were part of the recent Kennedy Center Honors festivities honoring Merle Haggard in Washington, and during the numerous functions, the three country music legends apparently had some time to discuss the possibility of a supergroup. 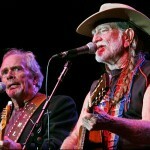 Previously Merle had discussed plans of doing an album with Willie, but in an exclusive interview with The Rolling Stone, Merle explained how Kris Kristofferson’s name got added to the mix. We got to eat a little something together. We didn’t know what the hell this food was, but we thought it was funny. We (Merle and Willie) talked about doing that together, but with the presence of Kris, we talked about the three of us doing it. I’m sure if we’re healthy and live to do it, we’ll do it. We thought about the title: the Musketeers. You know, because there’s the three of us. We’ll come up with some little way of describing ourselves I guess and put it together into a show. Of course Willie and Kris were members of The Highwaymen, a supergroup that also included the now deceased Johnny Cash and Waylon Jennings. Merle and Kris toured together in 2009 and again in early 2010 in an exclusively acoustic show. 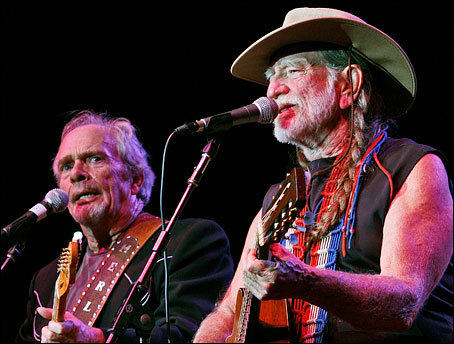 Merle & Willie were part of the Last Of The Breed album and tour with Ray Price in 2007. No details yet if the “Musketeers” would be solely an album project, a tour, or a full blown supergroup. Merle also sung the praises of his Kennedy Center Honors presentation, despite some not being impressed. Well, it’s the ultimate . . . it’s great, and probably couldn’t be topped. And I enjoyed watching Vince Gill give Brad Paisley a lesson ­ he took a course on “Workin’ Man Blues.” But Brad is so hot and so good. I believe that would be the definition of a must see show. actually in March Kris and Merle are doing a show at Horseshoe casino,I’ll be covering.They sent me the press pass already. They are already doing 10 shows this year with NO BAND it’s solely acoustic.. The Musketeers are speculated to be an album later this year and iv’e heard they’ll do casino shows throughout 2011 and 2012.
like Jerry Lee Lewis and Moe Bandy and Joe Stampley now. Moe Bandy is name I haven’t heard of in long time, wow, I remember going to Branson and seeing him a couple summers in a row when I was younger. Hopefully this turns into a tour. I’m still kicking myself for missing Merle and Kris last spring. This would be amazing. The three living legends. It was bound to happen. Hopefully Merle stays healthy for a long time to come. I was at the 1st Merle and Kris “acoustic” show and they had a band. It was a smaller version of the Strangers. It was a great show but we all thought it was going to be just the 2 of them. I’m sure the album will be great. Hope they come around soon. I went to that tour as well. I was pretty impressed with the set. You’re right, it was advertised as “Two Legends, Two Guitars”. I think it was fitting to have the small backing band however, especially Binion. Great premise, terrible name! How about “Blind Mice’ or “Wise Men” “Wishes”. There were three of them too. I kid I kid. No, you’re right. That might not be the eventual name, or it might have been in jest. Just feeling my way around the site. Admit I don’t know who some of the acts on here are… I guess I will learn. I think there is a bit more access in other parts of the country than up here in MN, thus the name “IceColdCountry”. Toby Kieth opened a place up here in the fall…no thanks. We do have some dives up here though worth coming to play. I do like the sound of this though. Read a bit about it on another site discussing the Kennedy Center Honors. This would be great.